This century is only 12 years old, but we already have several additions to the pantheon of capital G great science fiction films: Children Of Men. District 9. Moon. Eternal Sunshine. And now, we can add Looper. First of all, this movie is set in the future. Actually, it’s set in two futures: 30 years from now future, and 60 years from now future. 60 years from now future has developed time travel, and criminals there send the guys they don’t like back to 30 years from now future to be killed. The people who do the killing are called Loopers. Joseph Gordon-Leavitt is one of them. Jeff Daniels is his boss. Daniels was a criminal in 60 years from now future, but now runs the show in 30 years from now future. All is well, until Gordon-Leavitt discovers that he grew up to be Bruce Willis. That isn’t quite as awesome as it sounds, as Gordon-Leavitt is expected to kill his older self. This proves to be pretty difficult, because Bruce Willis. This all sounds quite convoluted, but actually it’s pretty simple; At it’s heart, this is a movie about family. What makes up a family? Is it blood? Luck? Good intentions? A little bit of all three, it turns out. Though it doesn’t seem to be on pace to doing even a fraction of the box office of something like Inception, the heart & soul that beats at the centre of this film is going to guarantee that this movie keeps going as a cult classic for years to come. There is plenty of time travel trickery, guns, and bang for those of us who like that sort of thing. 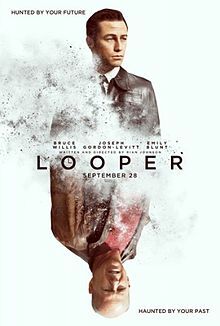 But for those of us who need a rock solid emotional core in our science fiction, Looper is a revelation. Rarely does an action movie convince us care so much about it’s characters. Bruce Willis in particular rolls out his best work in a decade, with a visceral desperation so tangible that we can almost smell the despair coming off of him. Bruce Willis is holding himself hostage. Not a euphemism for masturbation. as well, showing a range that proves that his recent foray into leading man roles is justified. But it might be Emily Blunt who steals the show, continuing her quiet, steady quest to being recognized as one of the most talented actresses of her generation. 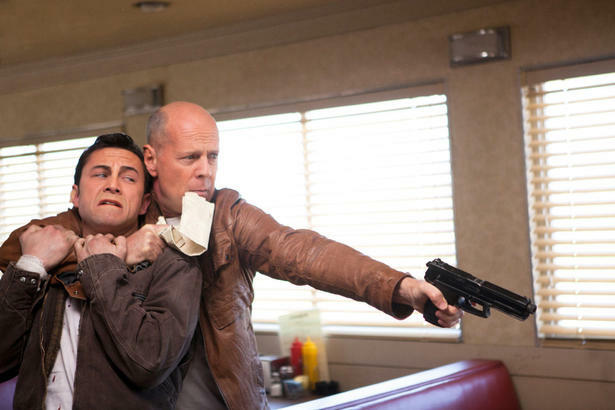 Looper a bold film, and Johnson isn’t afraid to try to use bombastic sci-fi trappings to tell a smaller, more personal story. It’s a fantastically well-written script, with as much attention paid to personal resonance as there is to resolving plot holes (though there are a few). Johnson really has crafted a bit of a populist masterpiece here. Arthouse snobs will find enough existential hand wringing to delight even the most douchey of Commercial Drive baristas, and for Ed Hardy models from Surrey, there are boobies and guns. This entry was posted in Movies and tagged Bruce Willis, Looper, Movies, Rian Johnson. Bookmark the permalink.